I loved all the other books in the seris, but the end was a bummerI would have wrote it different. How did they get off the island and back started. I really wanted there to more books but overall it was an ok book. Great series, the ending a huge disapointment. I enjoyed reading books 1-12. Awsome books, They were cleverly written. But Book 13, The End was a huge disapointment. The ending left me the feeling the I must of missed something. I was confused by the ending. Great books to read, book 13 was a waist of time. 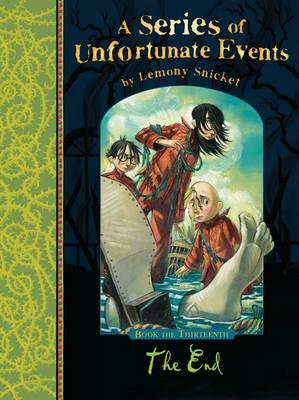 The previous book `The Penultimate Peril' awarded loyal readers of the Series of Unfortunate Events at last some small advancement and explanation of the greater themes of this series. Admittedly these were very small indeed and raised countless questions in response to the answers provided, but it was still a welcome change of pace and I enjoyed that book more than I had any of the ones that came before it in quite some time. If anything I had expected an even greater number of revelations in `The End', so many in fact that they would be tumbling over each other, rushing past one another and vying for the attention of the reader with every page, but in comparison to the previous book, `The End' is a title quite light on revelations for a large portion of the story. But even more disappointingly...this story is depressingly weak, or at least it's so familiar in plot and standard set-up to the early books of this series that after 250 pages of the same-old, same-old with only one meagre revelation to sustain me, I was actually hoping that `The End' wasn't the end, but was in fact only the beginning of the end and that there might be another book as yet unpublished entitled `The Epilogue' that would offer me the closure I so desperately craved (*that's an ode to Lemony Snicket whose list-making-mania and constant-cataloguing-of-minutia and rampant-repetitiveness actually surpasses itself in this final tale!). With the final fifty pages or so as the ending of `The End' drew near and a little bit of happiness was finally awarded the Baudelaire orphans and the author insisted that it was the best any reader of this series could hope for I couldn't decide whether I felt the same way, even though I could understand what the author was trying to communicate, it still felt like a betrayal that so much was left unexplained. Now I am left wondering whether the time I invested in this series was well spent, or a colossal waste of a small portion of my life. One piece of advice- set expectations to zero and you might just escape this novel and this series by gleaning some small amount of satisfaction from the sadly unresolved story of the Baudelaire orphans. As a huge fan of the entire season, I was curious as to if it could end as well as it started... But, thankfully, I LOVED it!!! It made me desperate (in a good way) to read the entire series through, looking for all the answers to all the questions. It was also surprisingly poignant, I thought, at the end. It was soft and gentle instead of laugh-out-loud funny (not that it didn't have it's hilarious moments earlier on). And I was kind of glad. Because even though the series is a bunch of clever jokes and crazy lunacy, I've been reading it for seven years, and wanted a feeling of completion. And Lemony Snicket (I refuse to call him Daniel Holder, lol) did just that!